Even though it was released three years after the first film, the story picks up toward the ending of the first film when Laurie Strode tells Lindsay and Tommy to go get help at the McKenzie’s house. Despite being shot numerous times by Dr. Sam Loomis (Pleasance), Michael Myers (Warlock) has survived and is “on the loose”. The infamous John Carpenter score takes over as the opening credits roll. Laurie has survived the horror after being stabbed in the chest by Michael and is being taken to Haddonfield Memorial Hospital. Try not to roll your eyes too much at the very obvious wig Jamie Lee Curtis is now wearing. News breaks that numerous teens have been murdered in Haddonfield, and the town goes on high alert. 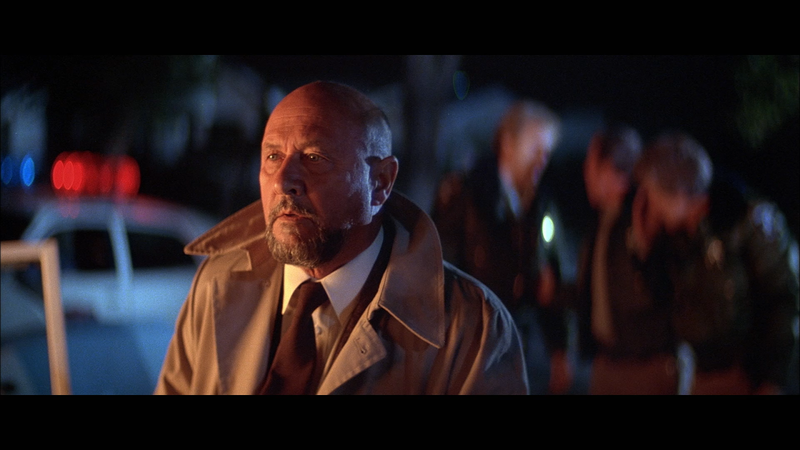 Dr. Loomis and Sheriff Brackett (Cyphers) take to the streets to continue their search for Michael. Blame is quickly put on Dr. Loomis as Michael was his patient and is now missing. No one knows what Michael looks like and with his mask on, he blends in with every other person walking the streets. You would think his creepy head tilts and slow walk would scare some people. Michael heads toward the hospital to continue his attack on Laurie. These first two Halloween films are not just about Laurie Strode as a victim, but also focuses on Dr. Loomis and his relationship with Michael. 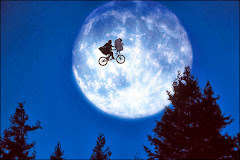 Both the first film and now the sequel pay close attention to the relationship Michael has with both of these people. If you have never seen the first one, it accomplishes the obligatory recapping of the events and details of who Michael Myers is and what happened when he was a little boy. Horror sequels sometimes become origin stories and sometimes hidden truths about a killer get revealed. Halloween II takes a deeper look into history of Michael Myers and answers the question of why he is after Laurie Strode. I am obviously not going to reveal that here! 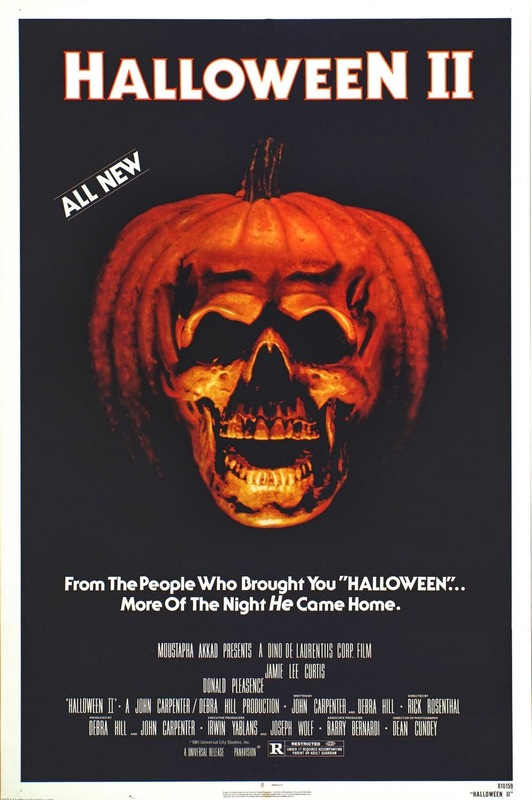 Director Rick Rosenthal, with help of Hill and Carpenter, tries to make the sequel have the style and feel of the first Halloween. Some of that attempt works well while some of the other approaches to the sequel really miss the boat and ignore what made the first film so eerie and haunting. Some of the earlier scenes are shot through the eyes of Michael Myers, which is how the first film starts and gives us the unique “through the killers eyes” perspective. The deaths are far more gruesome as he uses more than just his butcher knife on his victims. Michael adds hospital tools to his repertoire of killing devices. I personally think he should just stick to his large kitchen knife. It’s his signature weapon! The script just is not up to par with the original. Debra Hill wrote some fantastic dialogue in the first film for all of the supporting players making those characters memorable. Much of that is missing here and we are reduced down to numerous hospital workers as supporting players which makes each death less personal. 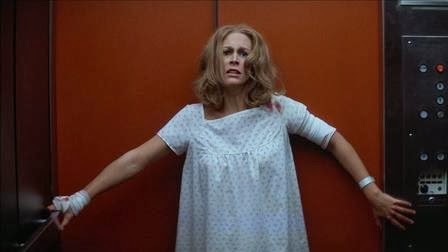 Even Jamie Lee Curtis is left mostly mute and traumatized without much to do except hobble around the hospital. She does a fantastic job, don’t get me wrong. I remember watching Halloween II first before seeing any of the other movies in the franchise. I think I was around twelve or thirteen years old at the time. My parents never let me watch rated-R movies, let alone horror movies, at that age. I was spending the weekend at my friends Brad and Brett’s house, and they were allowed to watch those types of movies. Needless to say, I took full advantage of the situation. Isn't that what you’re supposed to do at a slumber party? We went to a haunted mansion earlier in the evening and then rented Halloween II from the video store. I cannot remember the circumstances of why we got the second one over the first one. Maybe the first one was checked out at the time. This started my never-ending love of the Halloween series. A couple of years later, I rented the first one which then cemented my continual fascination of Michael Myers.